More than 30 countries represented among 200 artists at 14th annual Indian Wells Arts Festival, April 1-3. The acclaimed Indian Wells Arts Festival is returning for its 14th year, Friday, April 1 through Sunday, April 3, 2016, transforming the world-renowned Indian Wells Tennis Garden into an artisan village with more than 200 artists from across the USA and from over 30 countries around the world. Artists traveling distances as far as 9,200 miles from Uganda and Nigeria and 5,600 miles from Japan and Sweden will be showcased alongside well-respected hometown artist favorites in a true festival atmosphere that draws more than 12,000 visitors to the event. 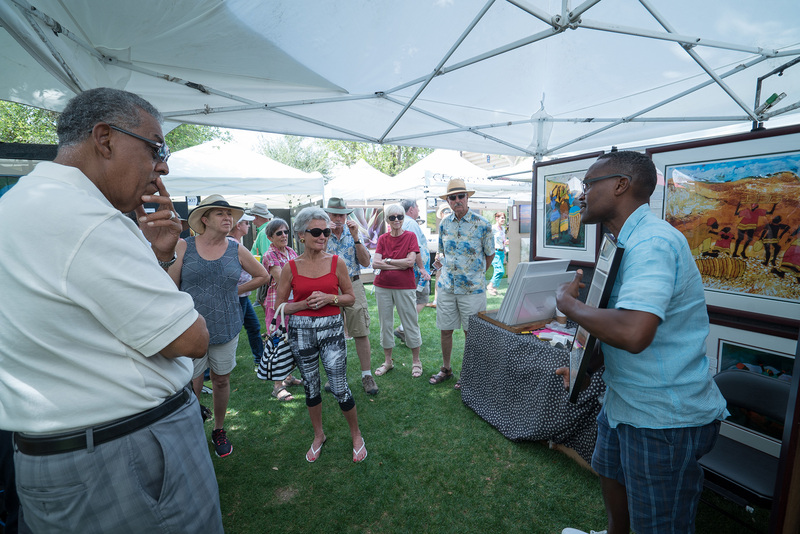 Festivalgoers will discover paintings, sculptures, ceramics, jewelry and more amid 35 visual arts mediums. Engaging art demonstrations by masters of their crafts will add to the enjoyment of gourmet food, lively music and activities for children and art lovers of any age. It is open from 10 a.m. to 5 p.m. Admission is $13 for adults and free to children 12 and under. Parking is free, and valet service is available. Located in the heart of Southern California's Coachella Valley, and as a key component of the Greater Palm Springs Area's burgeoning festival season that includes the Coachella Valley Music and Arts Festival and Stagecoach Festival performance events, the Indian Wells Arts Festival is a juried exhibition and artists' marketplace, with one-of-a-kind artworks available at multiple price levels. INTERNATIONAL PALETTE: The international draw of the festival allows festivalgoers to gain insight into creative visions from such diverse locations as Greece, Brazil, France and Russia, plus a host of artists local to the inspiring California desert communities and from across the United States for an experience that is both expansive and intimate. Visitors can experience artist demonstrations, from massive stone sculpting from High Desert artists David and Chris Falossi to Antonio Mendoza's ancient pedal-loom weaving techniques from the Zapotec culture of southern Mexico, as well as glass-blower Bruce Freund who bends and molds works of art with 2,000-degree heat from him custom portable furnace. THE PERFECT VENUE: For many years now, the backdrop of the beautiful Santa Rosa Mountains has enchanted tennis fans around the world who tune in for the BNP Paribas Tennis Tournament, making the Indian Wells Tennis Garden an international attraction unto itself. The picturesque setting and enviable climate provides for a world-class venue with state-of-the-art amenities right down to the filtered water on tap and luxurious marble-top facilities. 2016 COMMEMORATIVE POSTER: This year's commemorative poster is "Spirit of Indian Wells," an original 32 x 24 acrylic painting on canvas that celebrates the triumph of life in the desert, by San Diego-based artist Marna Schindler. A frequent visitor to the Coachella Valley and participant in the 2015 festival, Schindler enjoys a longtime artistic partnership with the world-famous San Diego Zoo and often finds her inspiration at The Living Desert Zoo and Gardens as with “Sprit of Indian Wells,” using bold colors to bring the oft-overlooked background of nature into the irresistible forefront. GOURMET MARKETPLACE: Expanding on the village atmosphere is the Gourmet MarketPlace with makers of original gourmet goods offering wares pleasing to the taste, such as craft vinegar and oil concoctions, as well as to the touch with artisanal bath and body products. The Indian Wells Arts Festival has grown to become the headlining event of the Coachella Valley's arts festival season. In its 14th year the event continues to garner an international draw featuring 200 juried artists from across the nation and more than 30 countries working in dozens of mediums ranging from painting, sculpture, photography, ceramics, textiles and jewelry, who are awarded first, second and third place ribbons by a panel of judges. Guests can meet and purchase directly from artists. 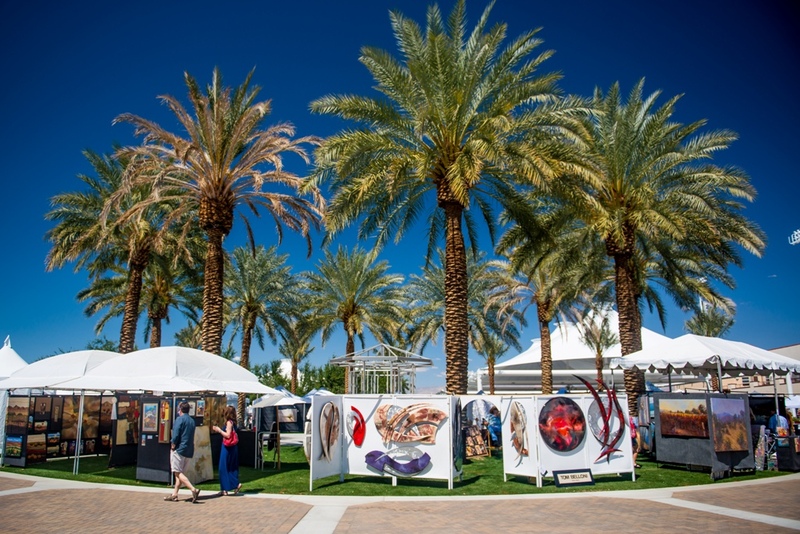 Rated “Best of the Best” by Palm Springs Life magazine, the Indian Wells Arts Festival is ranked in the top 100 fine art and fine craft shows in the nation by Sunshine Artist magazine and Greg Lawler Art Source Review. It has also been recognized as a Top 100 Event by the American Bus Association. 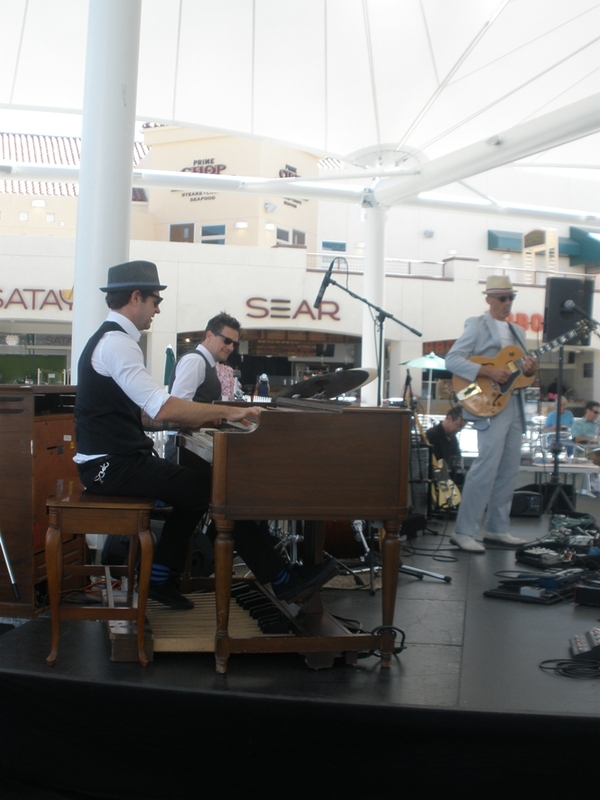 Live jazz music and entertainment can be found throughout the festival as well as a variety of food offerings and cocktails under an open-air shaded pavilion as well as the RumChata Bar and the Champagne Circle Bar. In addition, an “Eggs + Champagne in the Garden” brunch menu till noon is offered both Saturday and Sunday. The Indian Wells Arts Festival is proud to incorporate non-profit collaborations with community partnerships with the Ophelia Project, a national teen mentoring program; the Coachella Valley Youth Ensemble; and Cathedral City High School’s DATA Digital Imaging Apple Distinguished Program among other impactful youth and community groups. Primary sponsors for the Indian Wells Arts Festival include the City of Indian Wells as title sponsor; the Indian Wells Tennis Garden as host sponsor; The Desert Sun, Palm Springs Life Magazine, Hot Purple Energy, Raymond James Financial, Bank of Southern California, Saddleback Golf Cars, Jensen’s Finest Foods, Rite Aid, Bristol Farms, and Bagel Bistro. 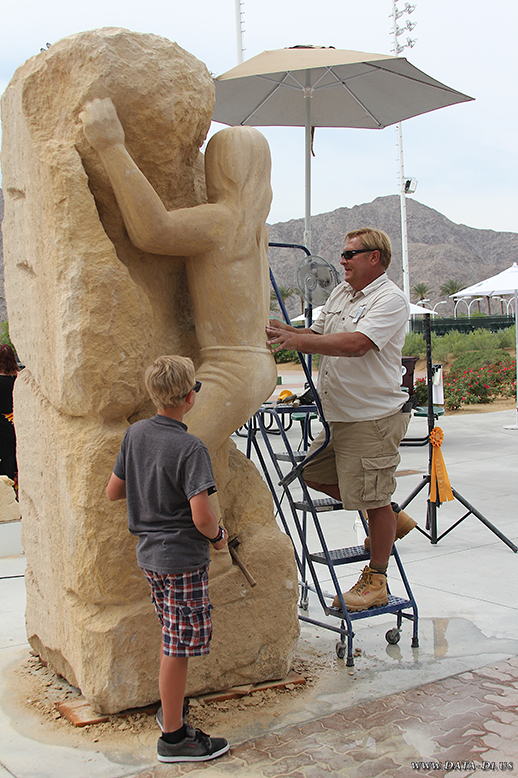 Indian Wells Arts FestivalArt and fun under the sun at the Indian Wells Tennis Garden IWAF father and son artists, David and Chris FalossiArtists David and Chris Falossi sculpting "Spirit Climb" from a 5-ton limestone block. 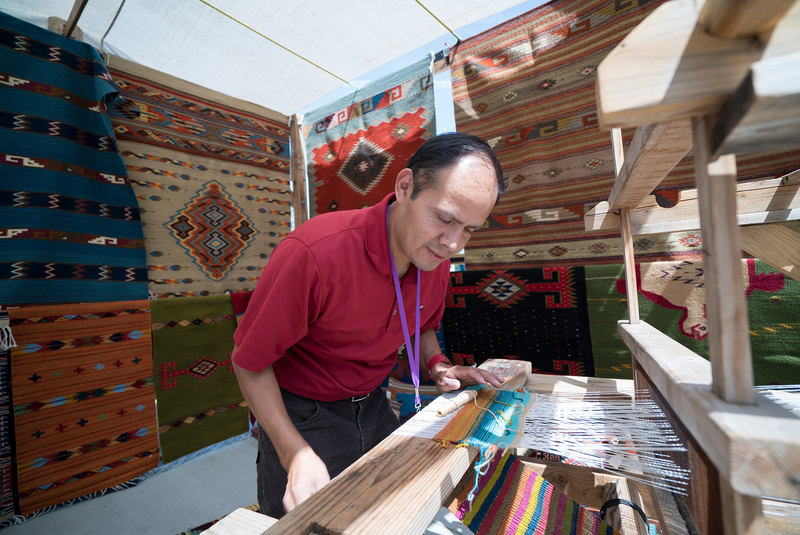 IWAF artist Antonio MendozaArtist Antonio Mendoza demonstrates the 2000-year Zapotec textile weaving technique. 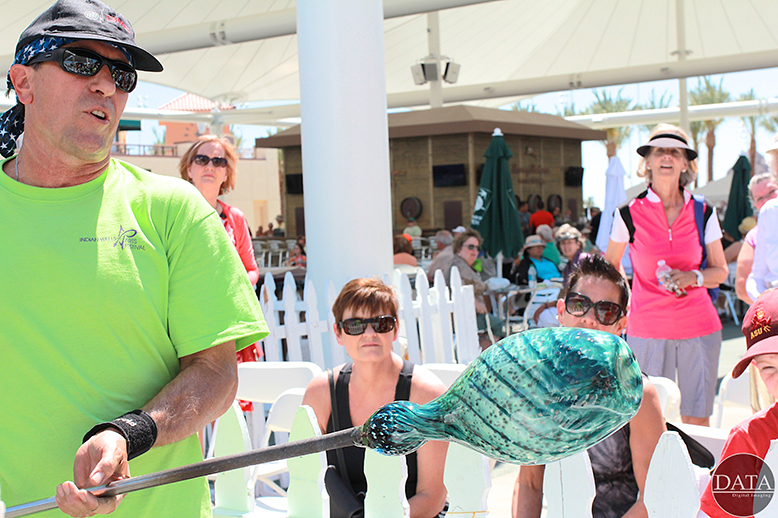 IWAF artist Bruce FreundArtist Bruce Freund engages festivalgoers with high-temperature glass-blowing. IWAF artist Paul NzalambaUgandan artist Paul Nzalamba describes his batik art to festivalgoers. Indian Wells Arts Festival Live EntertainmentOrgan trio Rumproller performs live for festivalgoers.